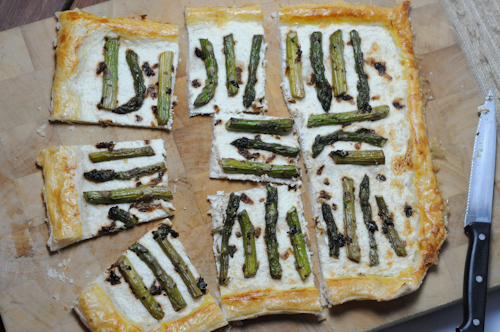 Asparagus Tart and Crispy Fried Asparagus Recipes, Spring Has Sprung! One of my favorite vegetables is asparagus and even though you can find them all year round, its Spring and Summer when I purchase them every week for us to enjoy. I prefer the nice plump ones to the thin ones because I feel that the fatter ones have the most delicious flavor. There are so many great recipes for asparagus that I could post about them for a week, but here’s a few ways we like to enjoy them. First off, there is grilling with just a bit of salt and a squeeze of lemon over top. Simple, easy and perfect for the outdoor dinner. The most classic way to cook them is to peel them, lop off the extra thick ends and blanch them briefly in boiling salted water. You can serve them immediately or you can refrigerate them and eat them cold with a tangy vinaigrette to dunk the spears in to. Then of course there is roasting them. Drizzled with a bit of olive oil and salt, roast them on a sheet pan covered with foil in an oven that’s been preheated to 425 degrees for about a half hour or until tender. Roasting the asparagus brings out the sweet essence of the vegetable and is so simple yet so incredibly delightful, you’ll end up eating all of them before they arrive at the table if you are not careful. Two other ways to enjoy this very versatile vegetable is to encase them in cheese and puff pastry or to batter and fry them. We have enjoyed both ways! Preheat oven to 400 degrees F. On a floured surface, roll out the puff pastry into a 16-by-10-inch rectangle. Trim uneven edges. Place pastry on a baking sheet. With a sharp knife, lightly score pastry dough 1 inch in from the edges to mark a rectangle being careful to not cut all the way through the dough. Using a fork, pierce the dough inside the markings (called Docking) to prevent air bubbles from forming and puffing up the center too much. Bake until a pale golden, about 10 minutes. Remove pastry shell from oven, and set aside. In the meantime, mix the ricotta cheese with the Gruyere, nutmeg, salt and pepper to taste. Spread the cheese mixture over the center of the pastry and arrange the asparagus spears in a single layer over the top alternating the ends and the tips. Brush the edges of the pastry with the egg wash and bake until spears are tender, 20 to 25 minutes. In a medium bowl combine all of the ingredients and mix until the spices are blended through. Cover with plastic wrap and refrigerate while you are making the asparagus to let the flavors meld together. Be sure to taste to see if it spicy or tangy enough for your tastes and adjust seasonings as necessary. 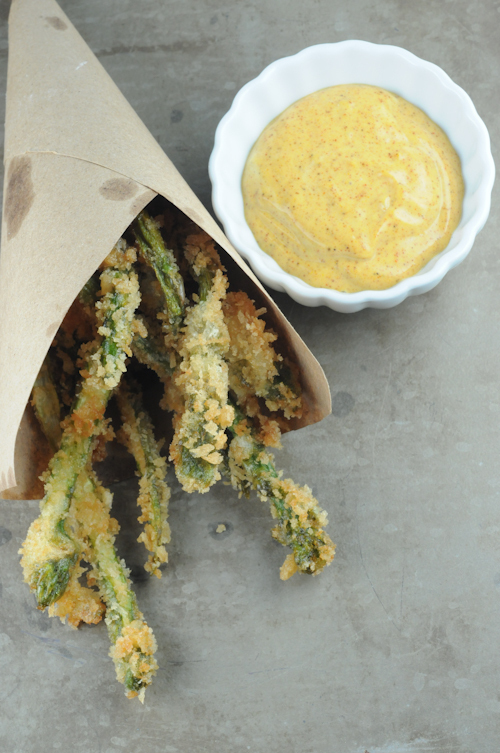 Adapted from Fine Cooking Magazine’s April/May 2011 Asparagus Fries with Smoked Paprika Aioli. Cut the asparagus to about 4-5 inches long. (You can save the stalks for another recipe!) If they are very thick you can split them lengthwise. Create your breading station by laying out three large shallow dishes with rims. In the first shallow dish, mix the flour, salt and pepper. In a second shallow dish, combine the egg whites, water, and lemon juice. In a third shallow dish, mix the Panko bread crumbs, plain bread crumbs, and the lemon zest. Heat the oil in a large sauce pan over a medium flame. If you have a candy thermometer or deep fryer heat the oil to 375 degrees F. If you don’t have a thermometer, you can tell if the oil is ready by dropping in a few of the Panko crumbs and if they bubble and rise to the top then the oil is ready. Divide the asparagus into 4 smaller bunches, first toss them into the flour mixture, shake off the extra, and then dip them into the egg whites, and then into the Panko/ bread crumbs. Carefully place the asparagus into the oil and fry for 3-4 minutes until they are golden brown. Remove the asparagus from the oil with a slotted spoon or tongs, and drain on a paper towel. Sprinkle with salt. Serve with the Ancho Chili Mayo on the side. My friend Anna was here and we shared some empanadas that I had made a few days before. She had never had this kind before, as the recipe I used originated in Argentina and is vastly different from the kind of empanadas she described from her country, El Salvador. 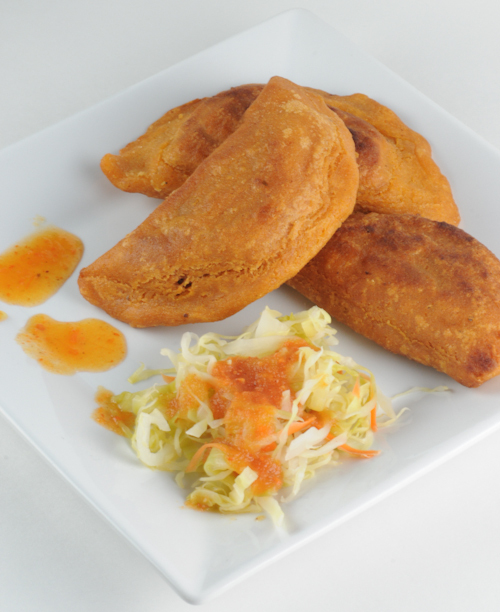 The empanadas of her home country are commonly sweet desserts made with plantains or other fruits. 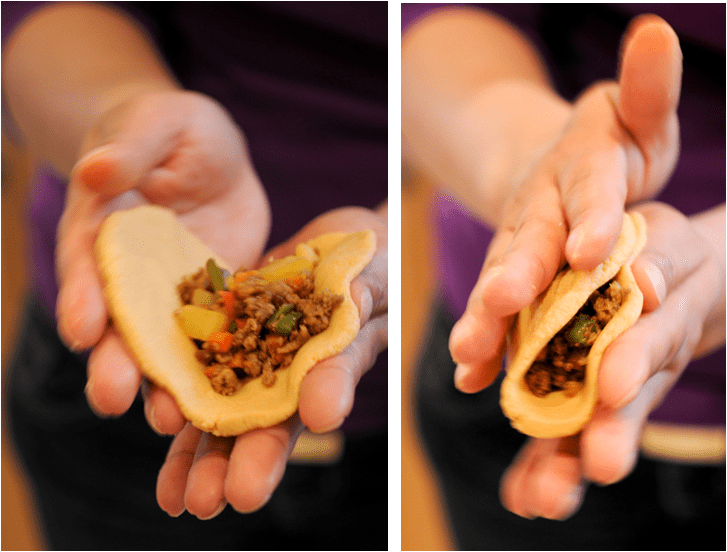 My empanadas are made with either poultry or ground meat and depending on how I am feeling, I will make them spicy or semi-sweet and they are always served with a tangy dipping sauce. So we got to talking about the food from her homeland and what she likes to cook and eat in her home. And of course we discussed what her children like and don’t like since we both have girls the same age. (Mine are much pickier than hers. Not really a shock!) We talked about ingredients and the availability of authentic ingredients to which she happily replied, “In NY, we can find everything”. That is so true! In NYC you can find nearly anything from any country! If not, there is always the internet! 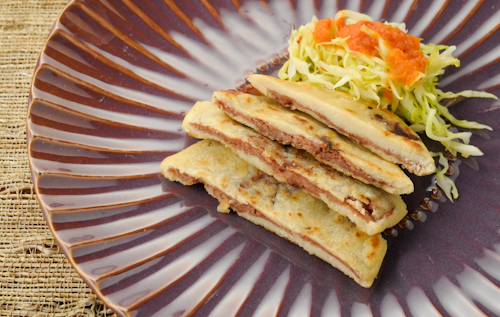 Instead of empanadas, Anna said, they make another variation of a meat pie, the pastelito. 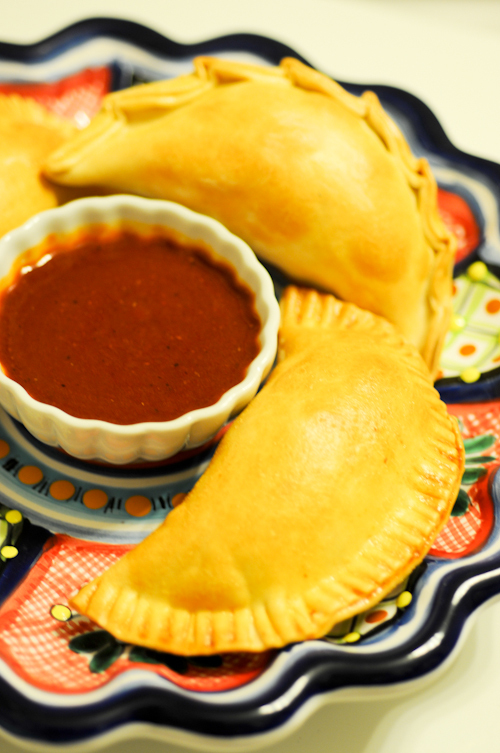 Using masa that has been tinted red with a lot of paprika or achiote powder, these savory meat pies are a staple in her home. Filled with chopped meat, diced potatoes, carrots and string beans, it is a whole meal in a handheld pastry shell that has been fried in oil. 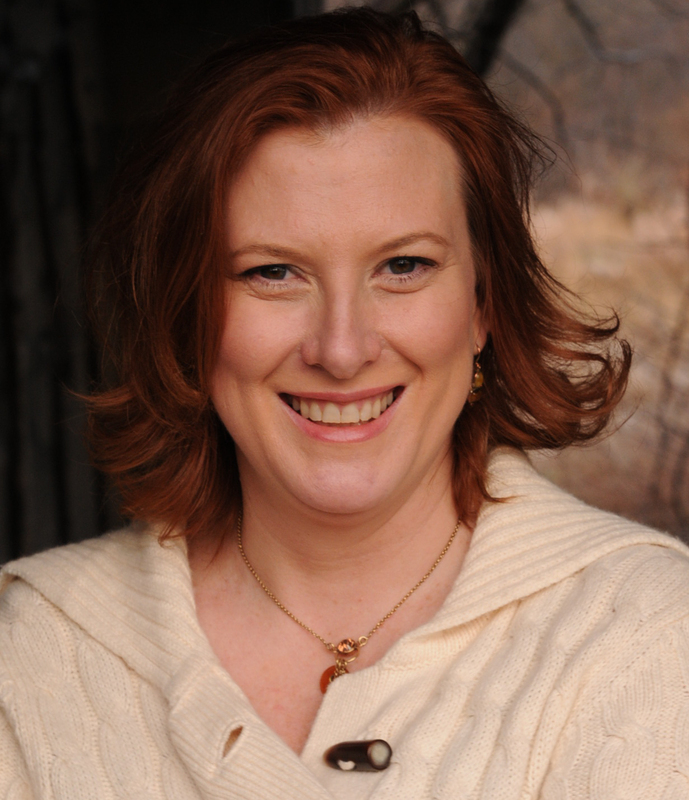 She graciously shared with me how she makes them, guiding me every step of the way. Her hands move so fast and create perfect circles. It was incredible watching her shape the dough and fold them. The ones she made were perfect circles! She was also able to make at least three in the time it took me to make one. (Okay, she maybe made five, but who’s counting!) They were so good too. Not spicy but very flavorful. These photos don’t really do them justice. The deep red dough was an amazing color! I asked to her to come back and show me more. So, the following week, she returned and taught me how to make another staple from her household, Pupusas. These are a thick, hand-made corn tortilla filled with a blend of cheese and refried beans (frijoles refritos) that are cooked over a high heat, but with very little fat. Along with both of these recipes she made a type of cabbage slaw called Curtido, that is topped with a very light tomato “salsa”, that you eat as a side with the pupusas. It’s a full meal! Salad/slaw and a healthy protein! Can’t go wrong! I can’t decide which week’s delights I prefer. I think I really love them both. But more importantly, I really enjoyed our time together and her teaching me how to make something new. 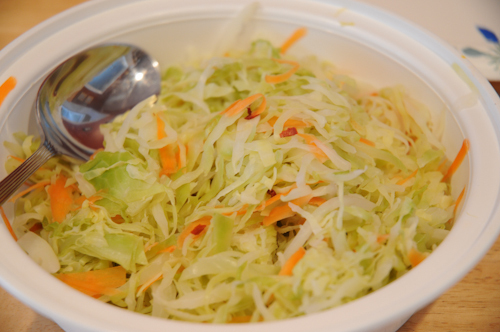 Place the cabbage and carrots in a large heat-proof bowl. Pour the boiling water into the bowl to cover the cabbage and carrots and set aside for about 10 minutes. Drain in a colander, pressing out as much liquid as possible. Return the cabbage to the bowl and toss with the remaining of the ingredients. Let set at room temperature for at least one hour or more to absorb all the flavors of the vinegar and spices. Chill and serve with the salsa as an accompaniment to pupusas, pastelitos or simply as a side dish. Place all ingredients into a blender and pulse until liquefied. Remove from the blender to a small pot and simmer, stirring occasionally over medium heat until just bubbling. Remove from heat. Prepare the dough. In a large bowl, add the masa and gradually add the water, paprika or achiote until the dough is a nice red color (1/4-1/2 cup), add a generous dash of salt and pepper and continue kneading until the dough forms a ball that can be handled and will not crumble. Add more water if necessary. Set aside. Prepare the filling. In a large skillet over medium high heat, add the ground beef, stirring until it is browned through. Remove from heat and drain some of the fat but not all of it (leave a few tablespoons in the pan). Return the meat to the pan and add the onion, green beans, potatoes, carrots. 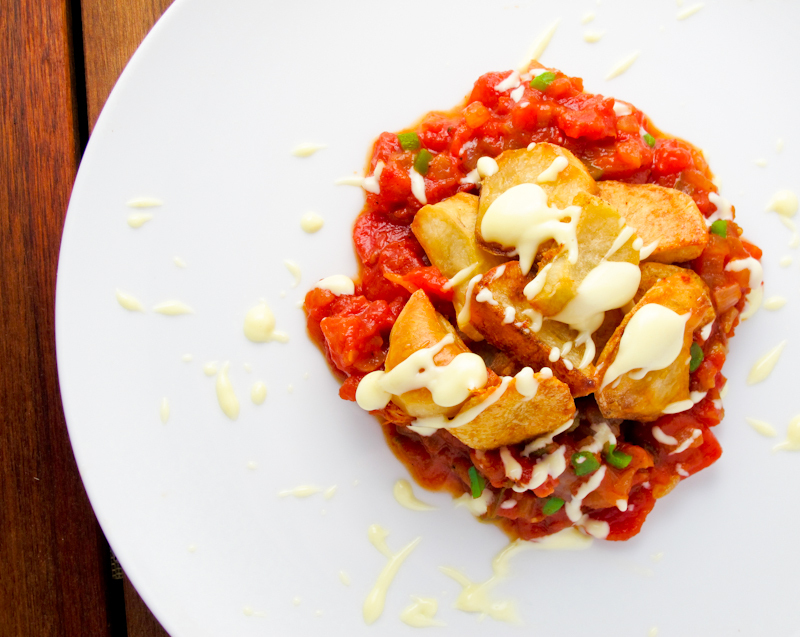 Continue to cook, covered until the potatoes are tender, about 10 minutes. Add the seasoning, the beef consommé or bouillon, Sazon Goya, cumin and salt and pepper to taste. Remove from heat and allow to cool while creating your dough discs. To create the discs, you can either do it by hand working the dough by patting it together and forming a round or you can flatten them out between two pieces of plastic wrap. 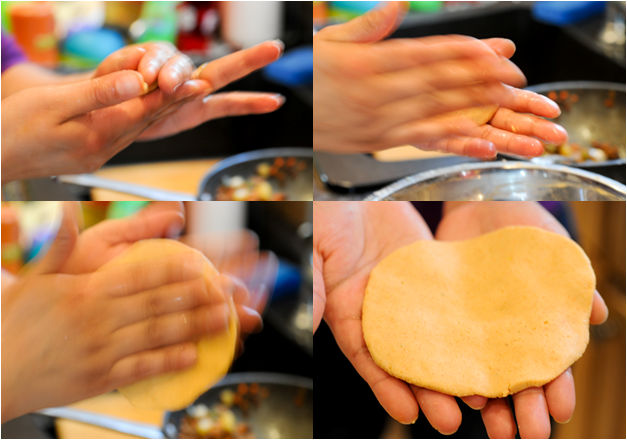 Making sure your hands are really wet makes shaping the discs easier. But you would like to create discs that are about ¼” thick and have a diameter of about 4-5”. You should have enough dough to make about a dozen discs. Set aside until ready to use. In a large frying pan, heat the oil over medium high heat being very careful to not let it smoke. Take one disc of dough and spoon in about 2 large tablespoons of filling. Fold over and seal the edges by squeezing them together. Place in the hot oil laying the pastelito away from you so as not to splatter the oil towards you. Repeat filling discs and placing in the oil until you have filled the pan with them, but do not overcrowd. Leave a lot of space in between each pastry. Fry until they golden brown on one side, flip over and continue to fry until the dough is golden brown. Remove with a slotted spatula onto a plate that been lined with paper towels to drain. Continue filling, folding and frying until they are all complete. Cover the plate with tin foil to keep the pastelitos warm until you are ready to eat. Serve with Crudito and the salsa. Prepare the dough. In a large bowl, add the masa and gradually add the water, add a generous dash of salt and pepper and continue kneading until the dough forms a ball that can be handled and will not crumble. Add more water if necessary. Set aside. Prepare the filling. In a medium bowl combine the cheese with 1-2 tbs of water and mash it together with your hands or a fork so the cheese is smooth. Add the beans to the cheese mixture and mix to combine well. Season with salt and pepper. Coat your hands with vegetable oil and create the discs of dough by rolling a golf ball sized piece into the palm of your hand, cupping it as you turn it to create a well. Fill with a tablespoon of the bean and cheese mixture and close the top of the ball. Flatten out into a round patty making sure it is well coated in oil. In a large frying pan, that has been heated over medium high heat lay the patty directly on the bottom surface. The oil on the patty will act as your fat. Repeat filling discs and placing in the pan until you have filled the pan with them, but do not overcrowd. Leave a lot of space in between each pastry. Fry until they golden brown on one side, flip over and continue to fry until the dough is golden brown. Remove with a slotted spatula onto a plate that been lined with paper towels to drain. Continue filling, folding and frying until they are all complete. Cover the plate with tin foil to keep them warm until you are ready to eat.